Child seats are bulky. Period. Volvo wants to change that though. 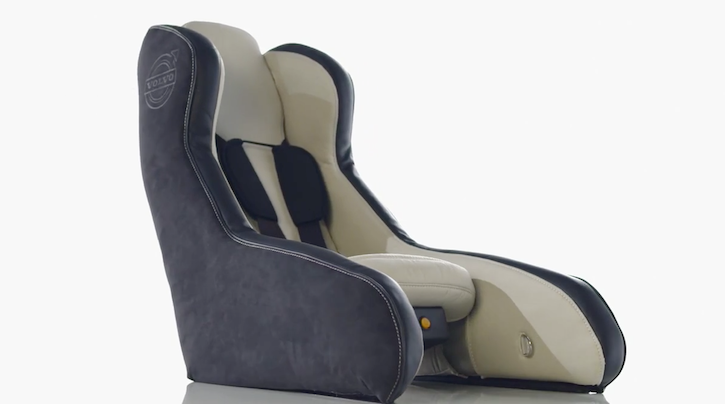 Watch the inflatable child seat concept video below to see how. The idea of an inflatable child seat is only a concept at the moment. Whether this thing will ever go into production remains to be seen. There are a few concerns that come to mind with this concept though. Since this is an inflatable product the obvious question of puncture damage arises. The seat will have to undergo rigorous testing before if gets approved for primetime. However, the concept does look interesting. The seat is said to inflate or deflate in less than 40 seconds with the push of a button and weighs less than 5 kg which is half the weight of a child seat these days. Once deflated, it fits in a backpack, saving space and can be hauled around with ease. Children's car seats are historically bulky, hard to move and tedious to mount. This is why Volvo Cars has designed a lightweight and inflatable rearward-faced child seat concept using groundbreaking technology. The seat is safe, easy to pack and carry and will enable parents to use it in many situations not practical with the seats on the market today. Should the child seat be the next piece of merchandise to get technology built in? And do you think they should go ahead and make this product?